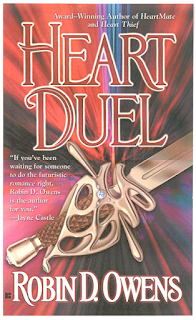 Belated Celta Thursday: Heart Duel Cover story: Below is the Heart Duel cover I have in my files. I never got the revised version that ended up on the book. When I wrote Heart Duel, I left a spot in my manuscript that read [describe sword on cover art here] which apparently flummoxed the copy editor and made my editor laugh when she told me about it. I think I got cover flats so I could change the description from a round diamond to a ruby in the final page proofs. All the online stores and ebooks have the cover below, only the mass market paperbook copies have the ruby cover. The description in the book is: Holm summoned the ceremonial HollyHeir sword from his suite. The intricate hand guard and central ruby gleamed. “I see you are collecting swords today,” Holm said. Celta Thursday: Cut, last performance of Firewalker: That night his play ended to furious applause, an outrageous number of curtain calls, and even a couple of “Bravos” from theater critics. He’d given this last show his all, as had the rest of the cast, and they partied on their own, with friends and family including Giniana and Thrisca and Melis and other Fams…but without the producer and his lover. Like others in the cast and the business, Johns would think a long time before signing on to work with that guy again, and he’d make sure the contract held a cancellation penalty if the play was making gilt and the man closed it down. Most people didn’t close down a profitable run to jump to another, iffy, one. 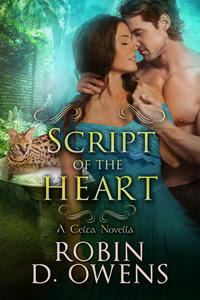 Celta Thursday, Cut from Script of the Heart: As you know, I write out of sequence so I have scenes that I think might make it into the book that don't. This scene was right after the climax at the summerhouse. Johns (hero) originally was contacted by Thrisca FamCat since (heroine) Giniana was so distressed: Laughter from the FamCat Thrisca rolled down their more open bond, along with, **Come, here! ** She sent him a black and white visual of Giniana’s back garden. He didn’t think he’d trust that FamCat. But he did teleport to the outer gate of T’Spindles. “Greetyou SpindleGuard Radican,” he addressed the man in the guardhouse. The older, heavily boned man pursed his lips. “Greetyou MasterLevel Actor St. Johnswort.” His body language showed Johns all too clearly that the guard believed he’d hurt Giniana. At the sound of a long cough, they both turned to see Thrisca FamCat behind the curliques of the greeniron gate. Radican Spindle waved his hand and the tall gates swung silently open. She simply turned her skinny body and walked down the path toward Giniana’s cottage.